This article is about a scripture of Hinduism. For field of traditional Indian medicine, see Ayurveda. A page from the Vajasneyi samhita found in the Shukla Yajurveda (Sanskrit, Devanagari script). This version of the manuscript opens with salutations to Ganesha and Sadashiva (Shaivism). The Yajurveda (Sanskrit: यजुर्वेद, yajurveda, from yaj meaning "worship", and veda meaning "knowledge") is the Veda primarily of prose mantras for worship rituals. An ancient Vedic Sanskrit text, it is a compilation of ritual offering formulas that were said by a priest while an individual performed ritual actions such as those before the yajna fire. Yajurveda is one of the four Vedas, and one of the scriptures of Hinduism. The exact century of Yajurveda's composition is unknown, and estimated by scholars to be around 1200 to 1000 BCE, contemporaneous with Samaveda and Atharvaveda. The Yajurveda is broadly grouped into two – the "black" or "dark"(Krishna) Yajurveda and the "white" or "bright"(Shukla) Yajurveda. The term "black" implies "the un-arranged, unclear, motley collection" of verses in Yajurveda, in contrast to the "white" which implies the "well arranged, clear" Yajurveda. The black Yajurveda has survived in four recensions, while two recensions of white Yajurveda have survived into the modern times. The earliest and most ancient layer of Yajurveda samhita includes about 1,875 verses, that are distinct yet borrow and build upon the foundation of verses in Rigveda. The middle layer includes the Satapatha Brahmana, one of the largest Brahmana texts in the Vedic collection. The youngest layer of Yajurveda text includes the largest collection of primary Upanishads, influential to various schools of Hindu philosophy. These include the Brihadaranyaka Upanishad, the Isha Upanishad, the Taittiriya Upanishad, the Katha Upanishad, the Shvetashvatara Upanishad and the Maitri Upanishad. 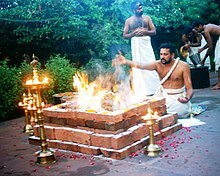 Yajurveda text describes formula and mantras to be uttered during sacrificial fire (yajna) rituals, shown. Offerings are typically ghee (clarified butter), grains, aromatic seeds, and cow milk. Yajurveda is a compound Sanskrit word, composed of yajus (यजुस्) and veda (वेद). Monier-Williams translates yajus as "religious reverence, veneration, worship, sacrifice, a sacrificial prayer, formula, particularly mantras muttered in a peculiar manner at a sacrifice". Veda means "knowledge". Johnson states yajus means "(mostly) prose formulae or mantras, contained in the Yajur Veda, which are muttered". Michael Witzel interprets Yajurveda to mean a "knowledge text of prose mantras" used in Vedic rituals. Ralph Griffith interprets the name to mean "knowledge of sacrifice or sacrificial texts and formulas". Carl Olson states that Yajurveda is a text of "mantras (sacred formulas) that are repeated and used in rituals". The Yajurveda text includes Shukla Yajurveda of which about 16 recensions are known, while the Krishna Yajurveda may have had as many as 86 recensions. Only two recensions of the Shukla Yajurveda have survived, Madhyandina and Kanva, and others are known by name only because they are mentioned in other texts. These two recensions are nearly the same, except for a few differences. In contrast to Shukla Yajurveda, the four surviving recensions of Krishna Yajurveda are very different versions. The samhita in the Shukla Yajurveda is called the Vajasaneyi Samhita. The name Vajasaneyi is derived from Vajasaneya, patronymic of sage Yajnavalkya, and the founder of the Vajasaneyi branch. There are two (nearly identical) surviving recensions of the Vajasaneyi Samhita (VS): Vajasaneyi Madhyandina and Vajasaneyi Kanva. The lost recensions of White Yajurveda, mentioned in other texts of ancient India, include Jabala, Baudhya, Sapeyi, Tapaniya, Kapola, Paundravatsa, Avati, Paramavatika, Parasara, Vaineya, Vaidheya, Katyayana and Vaijayavapa. There are four surviving recensions of the Krishna Yajurveda – Taittirīya saṃhitā, Maitrayani saṃhitā, Kaṭha saṃhitā and Kapiṣṭhala saṃhitā. A total of eighty six recensions are mentioned to exist in Vayu Purana, however vast majority of them are believed to be lost. The Katha school is referred to as a sub-school of Carakas (wanderers) in some ancient texts of India, because they did their scholarship as they wandered from place to place. The best known and best preserved of these recensions is the Taittirīya saṃhitā. Some attribute it to Tittiri, a pupil of Yaska and mentioned by Panini. The text is associated with the Taittiriya school of the Yajurveda, and attributed to the pupils of sage Tittiri (literally, partridge birds). The Maitrayani saṃhitā is the oldest Yajurveda Samhita that has survived, and it differs largely in content from the Taittiriyas, as well as in some different arrangement of chapters, but is much more detailed. The Kāṭhaka saṃhitā or the Caraka-Kaṭha saṃhitā, according to tradition was compiled by Katha, a disciple of Vaisampayana. Like the Maitrayani Samhita, it offers much more detailed discussion of some rituals than the younger Taittiriya samhita that frequently summarizes such accounts. The Kapiṣṭhala saṃhitā or the Kapiṣṭhala-Kaṭha saṃhitā, named after the sage Kapisthala is extant only in some large fragments and edited without accent marks. This text is practically a variant of the Kāṭhaka saṃhitā. Each regional edition (recension) of Yajurveda had Samhita, Brahmana, Aranyakas, Upanishads as part of the text, with Shrautasutras, Grhyasutras and Pratishakhya attached to the text. In Shukla Yajurveda, the text organization is same for both Madhayndina and Kanva shakhas. The texts attached to Shukla Yajurveda include the Katyayana Shrautasutra, Paraskara Grhyasutra and Shukla Yajurveda Pratishakhya. In Krishna Yajurveda, each of the recensions has or had their Brahmana text mixed into the Samhita text, thus creating a motley of the prose and verses, and making it unclear, disorganized. The core text of the Yajurveda falls within the classical Mantra period of Vedic Sanskrit at the end of the 2nd millennium BCE - younger than the Rigveda, and roughly contemporary with the Atharvaveda, the Rigvedic Khilani, and the Sāmaveda. The scholarly consensus dates the bulk of the Yajurveda and Atharvaveda hymns to the early Indian Iron Age, c. 1200 or 1000 BC, corresponding to the early Kuru Kingdom. The Vedas are notoriously hard to date accurately as they are compilations and were traditionally preserved through oral tradition leaving virtually no archaeological evidence. Scholars such as Georg Feuerstein and others suggest that the dates given to most of these texts is far too late. First harnessing the mind, Savita; creating thoughts and perceiving light, brought Agni from the earth. Harnessing the gods with mind; they who go with thought to the sky, to heaven, Savita instigates those who will make great light. With the mind harnessed, we are instigated by god Savita, for strength to go to heaven. Whose journey the other gods follow, praising the power of the god, who measured the radiant regions of the earth, he is the great god Savita. God Savita, impel the ritual, impel for good fortune the lord of ritual ! Divine Gandharva, purifier of thought, purify our thoughts ! May the lord of speech make our words sweet ! Honoring the gods, gaining friends, always victorious, winning wealth, winning heaven ! The title Satapatha Brahmana means "Brahmana of the Hundred Paths". It is one of the largest Brahmana text that has survived. It includes, states Staal, a "veritable encyclopedia of meandering opinions on ritual and other matters". The Satapatha Brahmana was translated by Eggeling in late 19th-century, reprinted often and has been well read because of the translation. However, it has been misinterpreted and misused, states Staal, because "it contains enough material to support any theory". Eggeling, the first translator of Satapatha Brahmana called it "flimsy symbolism rather than serious reasoning", similar to "speculative vaporings" found in the Christian and non-Christian variety of Gnosticism. The Yajurveda has six primary Upanishads embedded within it. The Brihadaranyaka Upanishad is found in the White Yajurveda. It is one of the Mukhya Upanishads, and among the largest and oldest as well (~700 BCE). It is a key scripture of Hinduism that has influenced all schools of Hindu philosophy. The text is a treatise on Ātman (Soul, Self), with passages on metaphysics, ethics and a yearning for knowledge that influenced various Indian religions, ancient and medieval scholars. This indeed is his (true) form, free from desires, free from evil, free from fear. knows nothing that is without, nothing that is within. he is free from any sorrow. The Isha Upanishad is found in the White Yajurveda. It is one of the shortest Upanishads, embedded as the final chapter of the Shukla Yajurveda. A key scripture of the Vedanta sub-schools of Hinduism, its name is derived from "hidden in the Lord (Self)". The Isha Upanishad discusses the Atman (Soul, Self) theory of Hinduism, and is referenced by both Dvaita (dualism) and Advaita (non-dualism) sub-schools of Vedanta. It is classified as a "poetic Upanishad" along with Kena, Katha, Svetasvatara and Mundaka Upanishads. The Taittiriya Upanishad is found in the black Yajurveda. It is the seventh, eighth and ninth chapters of Taittiriya Aranyaka, which are also called, respectively, the Siksha Valli, the Ananda Valli and the Bhrigu Valli. The Taittiriya Upanishad includes verses that are partly prayers and benedictions, partly instruction on phonetics and praxis, partly advice on ethics and morals given to graduating students from ancient Vedic gurukul (schools), partly a treatise on allegory, and partly philosophical instruction. The text offers a view of education system in ancient India. It also includes sections on ethics and invocation for one's personal development. Max Muller translates the text's tenth anuvaka, for example, as an affirmation of one's Self as a capable, empowered blissful being. The tenth anuvaka asserts, "I am he who shakes the tree. I am glorious like the top of a mountain. I, whose pure light (of knowledge) has risen, am that which is truly immortal, as it resides in the sun. I (Soul, Self) am the treasure, wise, immortal, imperishable. This is the teaching of the Veda, by sage Trisanku." The Katha Upanishad is found in the black Yajurveda. The Upanishad is the legendary story of a little boy, Nachiketa – the son of sage Vajasravasa, who meets Yama – the Indian deity of death. Their conversation evolves to a discussion of the nature of man, knowledge, Ātman (Soul, Self) and moksha (liberation). The Kathaka Upanishad is an important ancient Sanskrit corpus of the Vedanta sub-schools. It asserts that "Atman (Soul, Self) exists", teaches the precept "seek Self-knowledge which is Highest Bliss", and expounds on this premise like the other primary Upanishads of Hinduism. The detailed teachings of Katha Upanishad have been variously interpreted, as Dvaita (dualistic) and as Advaita (non-dualistic). The Katha Upanishad found in the Yajurveda is among the most widely studied Upanishads. Philosophers such as Arthur Schopenhauer praised it, Edwin Arnold rendered it in verse as "The Secret of Death", and Ralph Waldo Emerson credited Katha Upanishad for the central story at the end of his essay Immortality, as well as his poem "Brahma". The Shvetashvatara Upanishad is found in the black Yajurveda. The text opens with metaphysical questions about the primal cause of all existence, its origin, its end, and what role if any did time, nature, necessity, chance, the spirit had as primal cause? It then develops its answer, concluding that "the Universal Soul exists in every individual, it expresses itself in every creature, everything in the world is a projection of it, and that there is Oneness, a unity of souls in one and only Self". The Shvetashvatara Upanishad is notable for its discussion of the concept of personal god – Ishvara, and suggesting it to be a path to one's own Highest Self. The text is also notable for its multiple mentions of both Rudra and Shiva, along with other Vedic deities, and of crystallization of Shiva as a central theme. The Maitrayaniya Upanishad, also known as the Maitri Upanishad, is found in the black Yajurveda. It consists of seven Prapathakas (lessons). The first Prapathaka is introductory, the next three are structured in a question-answer style and discuss metaphysical questions relating to Atman (Self, Soul), while the fifth to seventh Prapathaka are supplements. However, several manuscripts discovered in different parts of India contain lesser number of Prapathakas, with a Telugu language version showing just four. The common kernel of the Maitri Upanishad across different recensions, states Max Muller, is a reverence for soul, that can be summarized in a few words as, "(Man) is the Self – the immortal, the fearless, the Brahman". The Maitrayaniya Upanishad is notable for its references to theories also found in Buddhism, elements of the Samkhya and Yoga schools of Hinduism, as well as the Ashrama system. The Yajurveda had Shrautasutras and Grhyasutras attached to it, from fifteen schools: Apastamba, Agastya, Agniveshyaka, Baudhayana, Bharadvaja, Hiranyakeshi, Kaundinya, Kusidaka, Katyayana, Lokaksita, Madhyamdina, Panca-Kathaka, Satyasadha, Sakala, Sandilya, Vaikhanasa, and Vadula. Of these nine have survived, along with portions of Kaundinya. Most surviving manuscripts and recensions of Yajurveda's Samhitas, Aranyakas and Brahmanas remain untranslated into Western languages. The two reliable translations are from British India colonial era, and have been widely studied. These are AB Keith's translation of Taittiriya Samhita of the Black Yajurveda, and Juliu Eggeling's translation of Satapatha Brahmana of the White Yajurveda. Ralph Griffith published an early translation of White Yajurveda Samhita. However, Frits Staal has questioned his translations and considers them "fantasies and best discarded". Devi Chand published a re-interpreted translation of Yajurveda in 1965, reprinted as 3rd edition in 1980, wherein the translation incorporated Dayananda Saraswati's monotheistic interpretations of the Vedic text, and the translation liberally adds "O Lord" and "the Creator" to various verses, unlike other translators. In 18th century, French Jesuits published Ezourvedam, claiming it to be a translation of a recension of the Yajurveda. The Ezourveda was studied by Voltaire, and later declared a forgery, representing Jesuit ideas to Indians as a Vedic school. Ashvamedhika parva of the Mahabharata describes the year long ceremony according to Yajurveda. ^ Jean Holm; John Bowker (1994). Worship. A&C Black. p. 88. ISBN 978-0-567-26232-5. ^ Frits Staal (2009), Discovering the Vedas: Origins, Mantras, Rituals, Insights, Penguin, ISBN 978-0143099864, pages 149-153, Quote: "The Satapatha is one of the largest Brahmanas..."
^ a b c Gonda, Jan (1975). A History of Indian Literature: Veda and Upanishads. Vol.I. Wiesbaden: Otto Harrassowitz. pp. 326–327. ISBN 3-447-01603-5. ^ Dowson, John (1984) . A Classical Dictionary of Hindu Mythology, and Religion, Geography, History. Calcutta: Rupa & Co. p. 319. ^ Feuerstein, Georg (2013-09-11). The Yoga Tradition: Its History, Literature, Philosophy and Practice (Kindle Locations 2645-2653). Hohm Press. Kindle Edition. "The dating of the first four historical periods is admittedly speculative, but so is the standard chronology found in college textbooks. The Vedas clearly must be assigned to an era well before the benchmark date of 1900 B.C.E., which will be explained shortly. How much earlier is not yet known with any degree of certainty, though astronomical references in the Vedas themselves, together with the dynastic genealogies (from the Purânas) and the list of sages in the Brâhmanas and Upanishads, justify a date at least two thousand or more years prior to 1200 B.C.E., which is the commonly accepted but patently wrong date for the composition of the Rig-Veda. Just as the Vedas must be assigned to an earlier period, the composition of the original Brâhmanas for very similar reasons must be pushed back in time before 1900 B.C.E. Likewise the oldest Upanishads, generally thought to have been created shortly before the time of the Buddha, ought to be placed much earlier in light of all this." ^ Oliver Leaman (2006), Encyclopedia of Asian Philosophy, Routledge, ISBN 978-0415172813, page 557, Quote: "It should be mentioned that although provision is made for human sacrifice (purusha-medha) this was purely symbolic and did not involve harm to anyone". ^ a b SH Nasr (1989), Knowledge and the Sacred: Revisioning Academic Accountability, State University of New York Press, ISBN 978-0791401767, page 99, Quote: "Emerson was especially inebriated by the message of the Upanishads, whose nondualistic doctrine contained so lucidly in the Katha Upanishad, is reflected in his well known poem Brahma". Devi Chand, The Yajurveda. Sanskrit text with English translation. Third edition (1980). Sanskrit Web Sanskrit texts of Taittiriya-Samhita,Brahmana,Aranyaka, EkagniKanda etc. with English translations of the Taittiriya-Samhita.